Edinburgh-based COCO is very good at making chocolate. But they needed a clear brand position: their own unique space in a competitive industry. 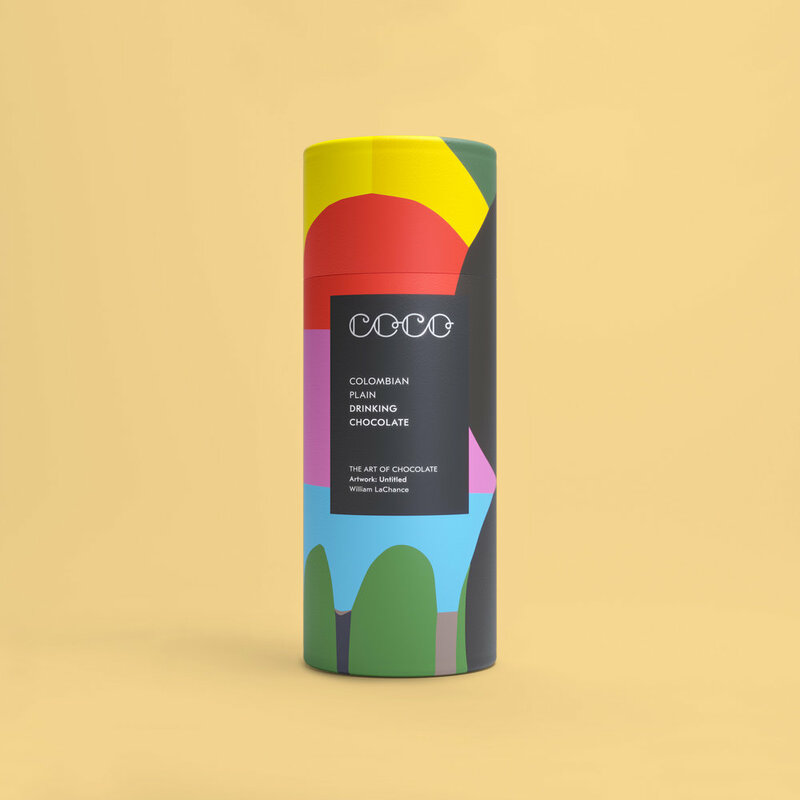 Initially, COCO was using striking geometric stock designs to wrap its chocolate bars. We felt that the relationship between art and chocolate could be built upon as a real point of difference at the heart of the brand. From this idea we developed the brand line ‘The Art of Chocolate’. It was equally important to make consumers aware of the brand’s defining ethical credentials. We did this with a set of pictograms designed to work alongside the logo and brand statement. Their simple visual language communicates the quality and provenance of the product at a glance. Hot chocolate tubes were printed with original artwork on the outside, mirroring the 80g / 30g chocolate bars. Artwork by artist William LaChance wraps the drinking chocolate. Born in St Louis, LaChance is an American painter and professor of painting & art history. Other commissioned artists include Palefroi, also known as Damien Tran and Marion Jdnaoff, French artists currently based in Berlin. They work at the crossroads of printmaking, illustration, publishing and applied arts. Rachael Hood is an Edinburgh-based graduate of Glasgow School of Art. Made by peeling away layers to create a textured, hand-made aesthetic, her work takes inspiration from cultural, geographic and socio-economic influences. Mari Campistron is an illustrator based in Glasgow. Her risograph print work combines colours, drawings and existing imagery to convey stories. Her work is featured on three COCO chocolate bars. COCO’s positioning has opened up opportunities to collaborate with art institutions such as Tate, V&A and National Galleries. We have developed a simple co-branded label format for such collaborations. A bold and dynamic e-commerce website was developed on the Shopify platform. A mix of artist video content, product information and chocolate experiences tells the multi-layered story of COCO, art and chocolate. COCO is passionate about challenging industry norms. 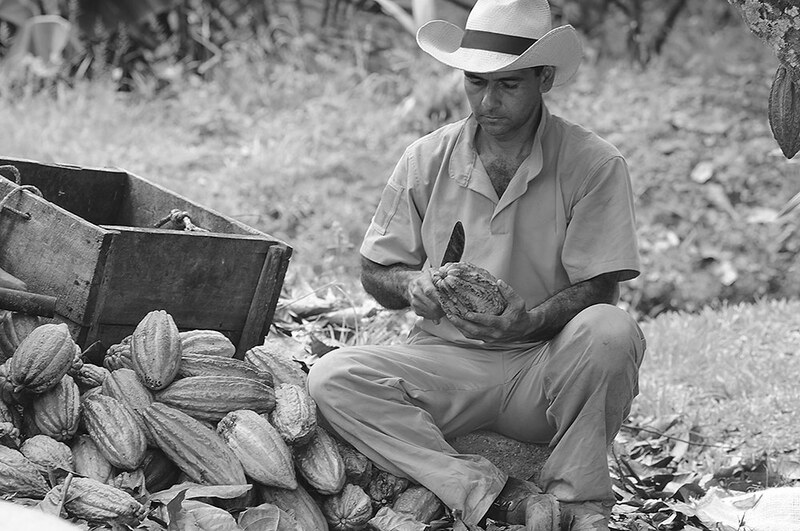 The making of its chocolate is begun at origin, meaning that more wealth remains within developing economies. Sustainably produced, the finished bars use 100% natural ingredients and are palm oil free.